Culture, conflict, and incredible craftsmanship have shaped this architectural gem that has survived the ravages of time. Tyumen. Trinity Monastery. Church of Sts. Peter and Paul (left), Trinity Cathedral. East view from Tura River. Sept. 4, 1999. At the beginning of the 20th century the Russian chemist and photographer Sergei Prokudin-Gorsky developed a complex process for vivid color photography (see box text below). His vision of photography as a form of education and enlightenment was demonstrated with special clarity through his images of architectural monuments in the historic sites throughout the Russian heartland. In June 1912, Prokudin-Gorsky ventured into western Siberia as part of a commission to document the Kama-Tobolsk Waterway, a link between the European and Asian sides of the Ural Mountains. The town of Tyumen served as a launching point for his journey north to Tobolsk, located on the Irtysh River. While there, he photographed the Trinity Monastery, one of the oldest in Siberia. 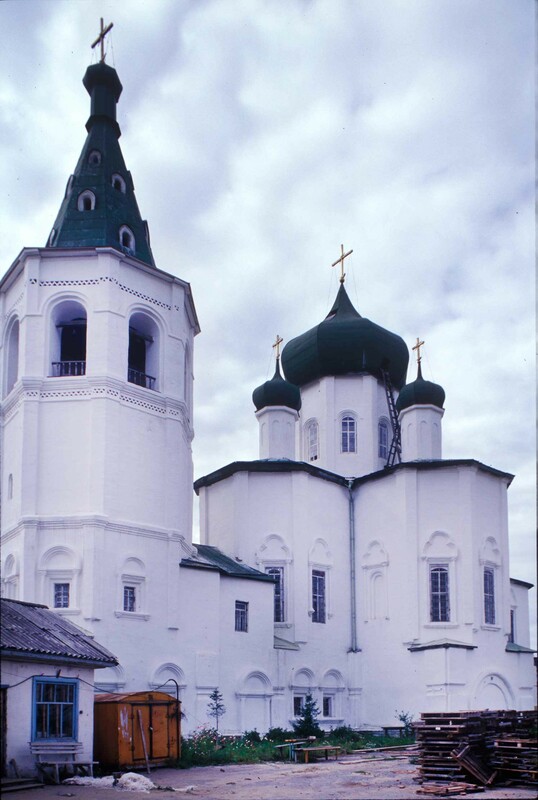 My photographs of Tyumen and Tobolsk were taken in the late summer of 1999. Trinity Monastery. Church of Sts. Peter and Paul, southwest view. June 1912. The opening of Siberia for Russian colonization during the late 16th and 17th centuries is the story of the conquest of vast distances in a severe land by enterprising Russian merchants, whose commercial interests coincided with the tsars' appetite for eastern expansion. Tyumen, founded in 1586 on the site of a Tatar encampment at the confluence of the Tura and Tyumenka Rivers, is considered the earliest permanent Russian settlement in Siberia. Trinity Monastery. 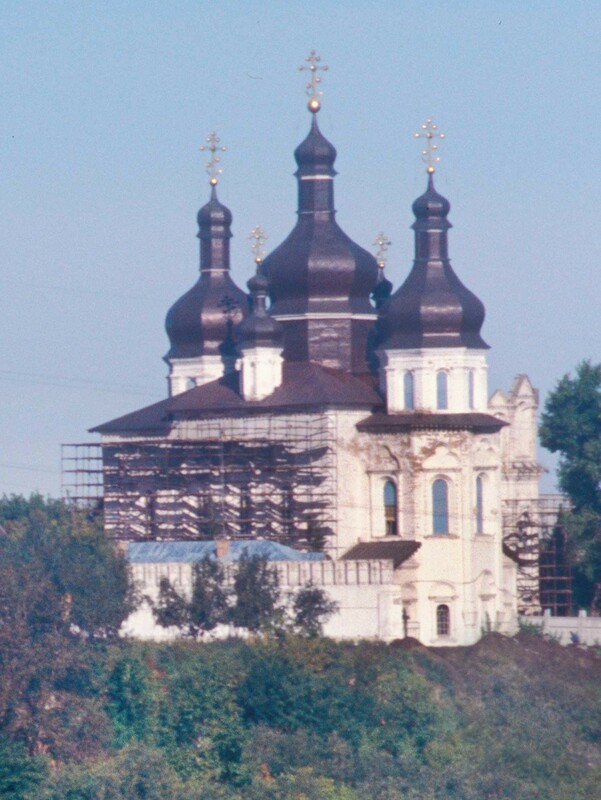 Trinity Cathedral, southeast view across Tura River. Sept. 4, 1999. Tyumen was established on the initiative of Boris Godunov, the power behind the throne of Tsar Feodor I, who became tsar himself in 1598. Godunov was aware of the importance of Siberia in part from his association with the Stroganov family. The Stroganovs had sent a detachment of Cossacks from their commercial center at Solvychegodsk into Siberia to challenge the power of the Tatar ruler, Khan Kuchum. The band of Cossacks was commanded by Yermak Timofeevich. Yermak's origins and identity remain a matter of dispute, but it is likely that he and his men had engaged in brigandage and river piracy before enlisting as mercenaries for the Stroganovs. Although the dates are open to question, it appears that in the fall of 1581, Yermak captured Chingi-Tura (later Tyumen) but abandoned it in order to proceed to Kashlyk, Khan Kuchum capital. Yermak defeated the khan in 1582 during a battle near the Irtysh River. Yermak himself died in a surprise raid in 1585. Trinity Monastery. Bell tower&Church of Sts. Peter and Paul, northeast view. Photo: William Brumfield. Aug. 29, 1999. Like most early Russian towns in Siberia, Tyumen served as a garrison fortress for Cossacks and other troops who protected trade routes, particularly with China, during the 17th century. Tyumen's location on the Tura River provided a direct link westward to the gateway town of Verkhoturye, which was founded by Boris Godunov on the Asian side of the Ural Mountains in 1598. To the northeast of Tyumen, the Tura flows into the Tobol River, which in turn joins the mighty Irtysh near Tobolsk. Given its favorable location, Tyumen was destined to play a significant role in the development of Siberia. There are no architectural remains from Tyumen’s first century. The early buildings were of wood (including the stockade walls) and were susceptible to fires, such as the one that destroyed most of the town in 1695. Subsequently, the Siberian Office in Moscow encouraged the use of brick and stone for major buildings. Masonry construction also reflected the views of the young Tsar Peter I (the Great), who undertook the expansion of the Russian presence in Siberia despite the burdens of a major war with Sweden. However, large fires continued to devastate the town (in 1705 and 1766), and the lack of qualified masons impeded construction. Trinity Monastery. Church of Sts. Peter and Paul, bell tower, south gate. Southwest view. June 1912. 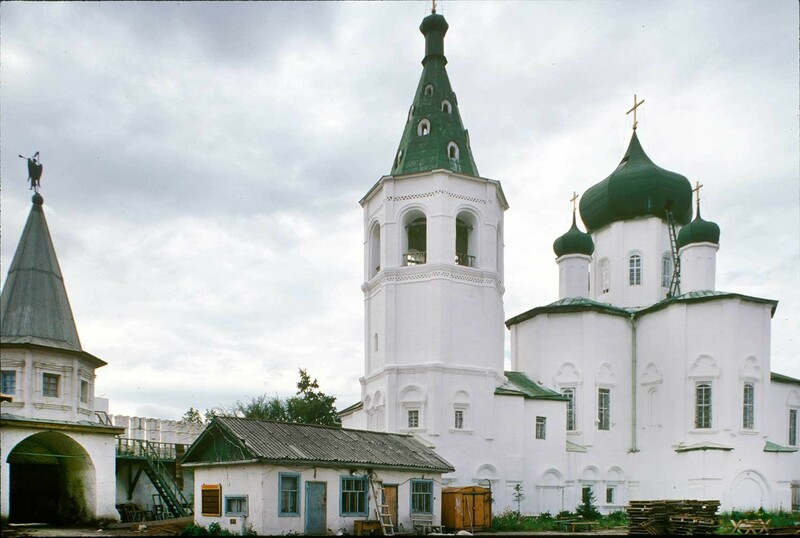 The most imposing early brick structures are at the Trinity Monastery, founded in 1616 (date uncertain) on the high right bank of the Tura River on the northern edge of Tyumen. 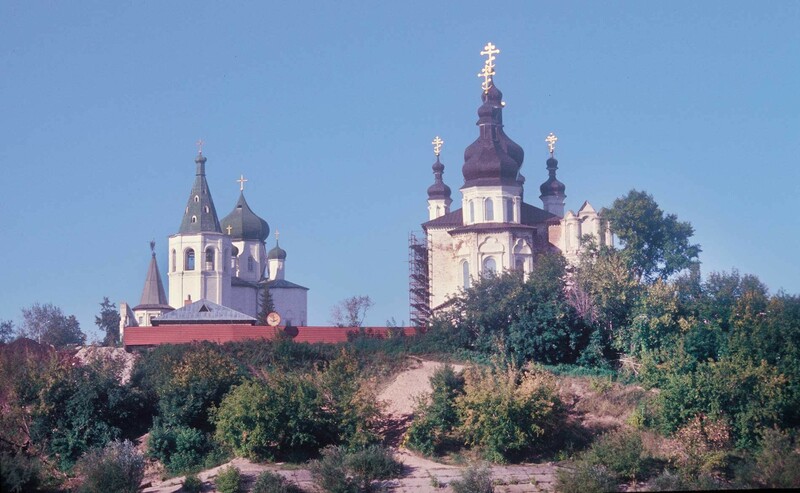 Originally dedicated to the Transfiguration of the Savior, the monastery was transformed in the early part of the 18th century by an energetic Ukrainian prelate, Filofei (Rafail Leshchinsky), who in 1702 was designated Metropolitan of Tobolsk and Siberia. Leshchinsky studied at the Kiev Spiritual Academy and subsequently rose in the hierarchy of the renowned Monastery of the Caves in Kiev. It is therefore not surprising that the architecture of the Trinity Monastery displays Ukrainian Baroque elements. The center of the monastery is dominated by the Cathedral of the Trinity, built in 1709-1715. From the exterior detailing to the form of the cupolas, the structure shows Ukrainian ornamental motifs to such an extent as to suggest completion by a Ukrainian builder. Trinity Monastery. South gate, bell tower, Church of Sts. Peter and Paul. Northeast view. Photo: William Brumfield. Aug. 29, 1999. The Trinity Cathedral was closed in 1923 and its interior was vandalized during the Soviet period. Additionally, its structural integrity was threatened by the construction of a water plant between the Tura River and the north wall of the church. This site actually had been the location of the monastery's second church, dedicated to the Forty Martyrs of Sebaste (also known as Saints Zosima and Savvatii), completed in 1717 and razed in the 1940s. Unfortunately, there is no record that Prokudin-Gorsky photographed it or the Trinity Cathedral. In 1711, Filofei resigned his position as Metropolitan of Siberia to become abbot of the Trinity Monastery. At the end of 1715, he resumed leadership of the vast Siberian Metropolitanate, but after five years, he again retired to lead the monastery until his death in 1727. Trinity Monastery. Church of Sts. Peter and Paul&bell tower. Southeast view. Sept. 4, 1999. 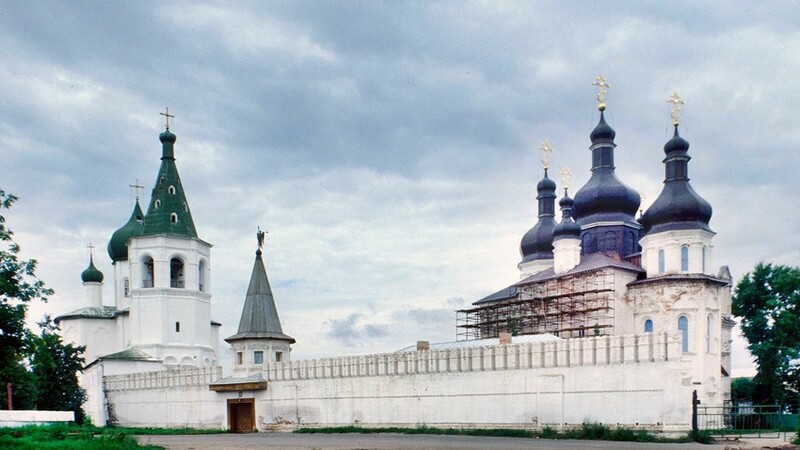 Filofei’s connections with the imperial court were necessary to continue construction at the Tyumen monastery. Peter the Great needed experienced masons for the building of St. Petersburg and had issued a ban on masonry construction elsewhere in Russia between 1714-22. Soon after the revocation of Peter’s construction decree, Filofei began planning for a third church at the Trinity Monastery — the Church of Saints Peter and Paul — together with brick walls, an entrance gate and a monastery residence. The lack of material and labor delayed foundation work until 1726, and the monastery's resources rapidly diminished after prelate's death the following year. Construction resumed some ten years later with the completion of the brick walls in 1739, the bell tower in 1741, and Church of Sts. Peter and Paul in 1755. Prokudin-Gorsky’s superb view of the Peter-Paul Church from open space outside the south wall shows a cruciform structure related to the Ukrainian Baroque, thus suggesting the completion of plans before Leshchinsky's death. 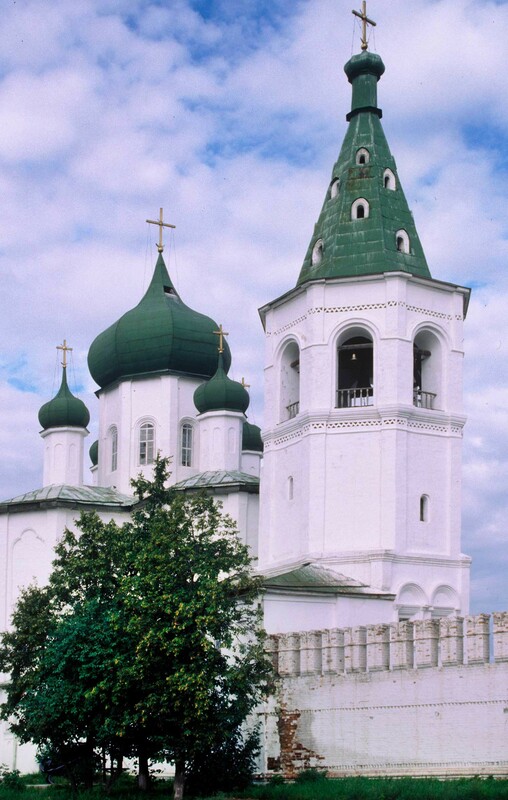 It is possible that the original domes resembled the two-tiered cupolas typical of Ukrainian architecture and still seen in the nearby Trinity Cathedral. 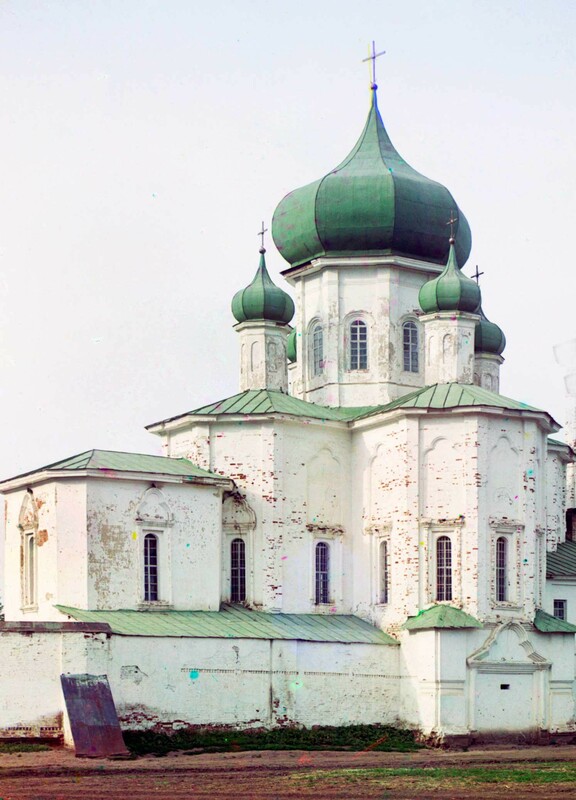 A fire in 1842 damaged the roof and led to a rebuilding with traditional onion domes that are visible in Prokudin-Gorsky’s and my own almost nine decades later. Trinity Monastery. Bell tower with Church of Sts. Peter and Paul. Southeast view. Aug. 29, 1999. 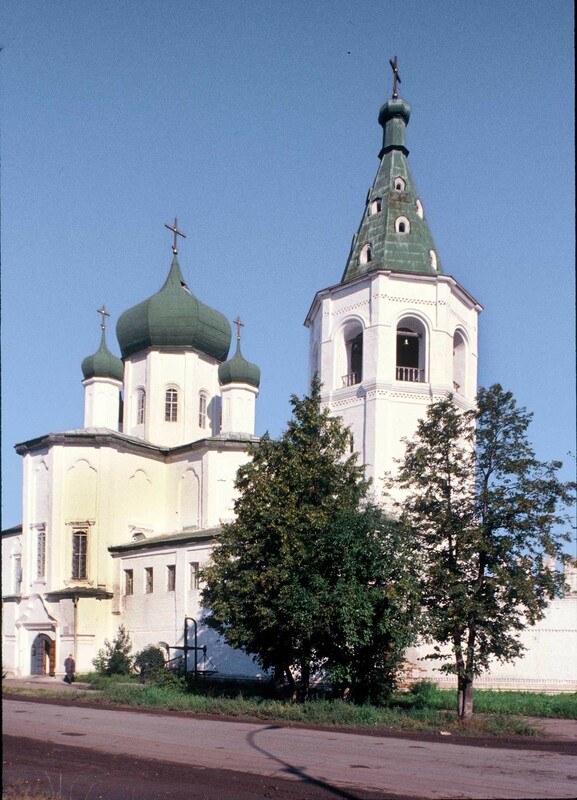 Although documentary evidence is lacking, the church design has been attributed to Semyon Remezov, the main architect of Tobolsk at the beginning of the 18th century. It bears resemblance to both the Church of St. George at Kiev's Vydubetskii Monastery and the Church of All Saints (1698-1701) over the Ekonom Gate at the Monastery of the Caves — monuments that would have been familiar to Leshchinsky. The large attached bell tower with a conical crown follows a pattern widespread in the 16th and 17th centuries. Recently restored and returned to active use, the Trinity Monastery once again graces the high bank of the Tura River. Trinity Monastery. From left: Church of Sts. Peter and Paul, bell tower, south gate&wall, Trinity Cathedral. Southeast view. Aug. 29, 1999. In the early 20th century the Russian photographer Sergei Prokudin-Gorsky devised a complex process for color photography. Between 1903 and 1916 he traveled through the Russian Empire and took over 2,000 photographs with the process, which involved three exposures on a glass plate. In August 1918, he left Russia and ultimately resettled in France with a large part of his collection of glass negatives. After his death in Paris in 1944, his heirs sold the collection to the Library of Congress. In the early 21st century the Library digitized the Prokudin-Gorsky Collection and made it freely available to the global public. Many Russian websites now have versions of the collection. In 1986 the architectural historian and photographer William Brumfield organized the first exhibit of Prokudin-Gorsky photographs at the Library of Congress. 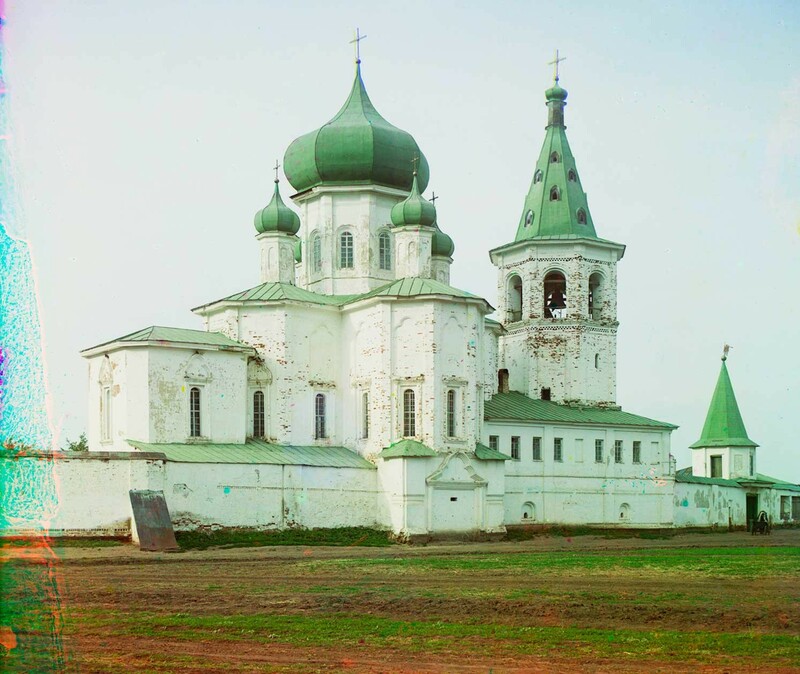 Over a period of work in Russia beginning in 1970, Brumfield has photographed most of the sites visited by Prokudin-Gorsky. This series of articles will juxtapose Prokudin-Gorsky’s views of architectural monuments with photographs taken by Brumfield decades later.